This is a fun spin on regular French toast; my kids LOVED that they could dip the sticks in syrup. They were fast and easy to make and super delicious! These would also be easy to make ahead of time and stick in the freezer for busy mornings! In a medium bowl, add eggs and beat well. Stir in milk. Add in vanilla and cinnamon sugar. Pour into a shallow dish (like a baking pan) and dip a piece of bread in egg mixture, turning to coat both sides evenly. 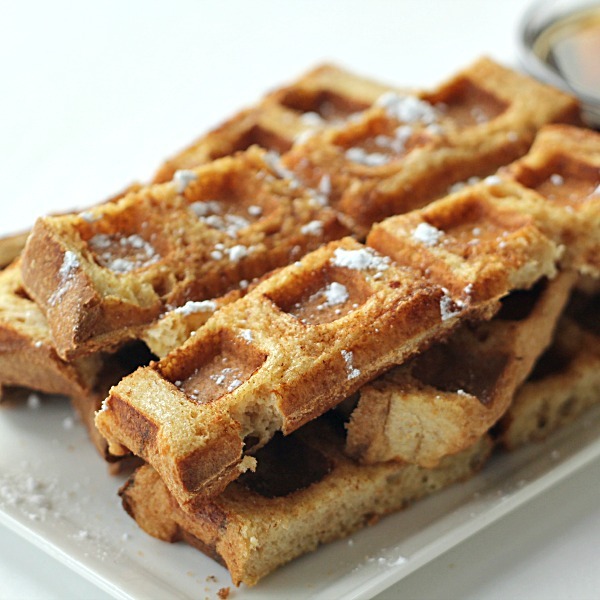 Cook bread on a lightly greased waffle iron on medium heat until browned on both sides. Remove bread and sprinkle with additional cinnamon and sugar while the bread is still warm. Cut each piece of bread into strips and serve with syrup. Sprinkle with powdered sugar if desired.